This will probably be my last post until I’m home from Sweden at the end of August. We’re away for 5 weeks travelling all over Sverige, with a few days on either side in Tokyo and Bangkok. 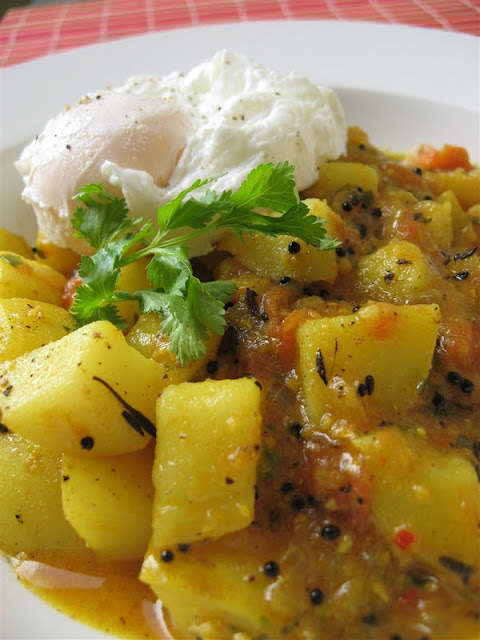 I wanted to leave you with a recipe I really love and which takes the humble potato to new heights while also turning breakfast into an exciting meal. 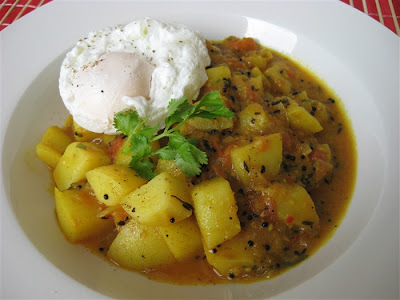 A lot of people (obviously not Indians) will baulk at the idea of curry for breakfast, but Rick Stein’s potato curry served with poached eggs is so gently spiced that anyone would adore it. I love eating interesting things at breakfast (Breakfast Crumble, Çılbır, Fatteh, Khabeesa, Moringa Omelette, Quinoa Porridge etc) whereas Jonas is an absolute traditionalist. 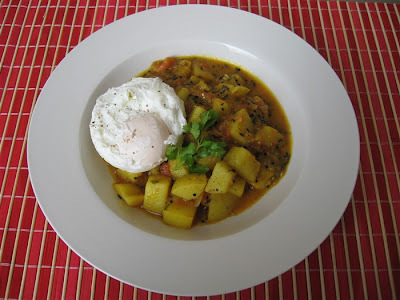 Nonetheless this potato curry won him over entirely and is a recipe that will make repeat appearances in our home. Who could have thought breakfasts and potatoes could be so exciting! Recipe by Rick Stein, Delicious Magazine April 2008. Serves 4. 1. 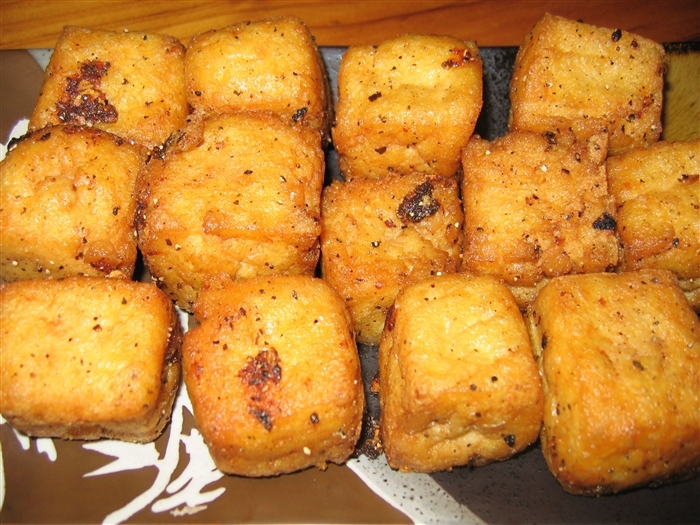 Peel potatoes and cut into 1cm cubes. 2. Cook the potatoes in a pan of boiling salted water for 5-6 minutes until almost tender, then drain and set aside. 3. Heat oil in a deep frypan over medium heat. Add mustard and cumin seeds. Cover with a lid until the popping subsides (about 2 minutes). 4. Meanwhile cut the cardamom pods in half and shake out the seeds into a mortar and pestle. Throw the husks away and lightly crush the seeds. 5. Uncover the pot and add onion, ginger and dried chilli and fry until soft but not brown (6-7 minutes). 6. Stir in ground spices then cook, stirring, for 1 minute until fragrant. 7. Stir in potatoes, 200ml water and 1 teaspoon salt. Simmer over a medium-low heat for 10 minutes, stirring occasionally, until potato is tender. 8. Stir in tomatoes and lemon juice and cook for another 2 minutes. 9. Stir in coriander, cover and keep warm over a very low heat. 10. To poach eggs, measure enough water so it reaches 5cm in a wide, shallow pan. 11. Bring to the boil then add 1 ½ teaspoons vinegar and ½ teaspoon salt for every 1.2 litres of water. 12. Reduce heat to medium-low and break eggs into simmering water. Poach for 3-5 minutes until white is cooked but yolk is still soft. 13. Remove with slotted spoon and drain on paper towel. 14. Lightly salt the eggs and serve on top of the curry with coriander garnish. This is my last Weekend Herb Blogging entry for a while, until I’m back. My feature ingredient this week is the humble spud. And what a veggie it is! The root of the Solanum tuberosum is the world's most widely grown tuber and is in fourth place as the most produced food crop, after rice, wheat, and corn. Today China and then India are the largest potato producers. The United Nations have decreed 2008 as the International Year of the Potato and many organisations see it as part of the solution for world food production since it is cheap to cultivates, generates good harvests and grows in diverse climates. Research seems to put the potato’s origin in the Andes from Colombia/Venezuela to northern Argentina and the first evidence of cultivated took place in Peru 7,000 years ago. Some 99% of the world’s cultivated potato varieties descend from a subspecies indigenous to South-Central Chile, probably due to the trading routes that carried the first plant exports. Lack of genetic varieties in Europe left potato crops vulnerable to diseases, such as Phytophthora infestans, which resulted in the infamous Irish famine and a reduction of Irelands population by 25% from starvation, disease and emigration to the New World. • A notice of 1573 shows that potatoes were being fed to the sick in a monastery of Seville, under their Quechua name papa. • The earliest reference to the potato in India is in a British journal from 1847. • The notion that “all of the potato’s nutrients” are found in the skin is an urban legend. While the skin does contain approximately half of the total dietary fibre, the majority (more than 50%) of the nutrients are found within the potato itself. Weekend Herb Blogging is host by Simona from Briciole, who has the coolest blog tagline of "an idiosyncratic and opinionated dictionary of Italian words related to food, with audio accompaniment". Be sure to visit her blog for the round-up. When the weather outside is frightful, this spicy chicken dish is delightful. The predominant flavour is paprika, so it’s important to use top grade. 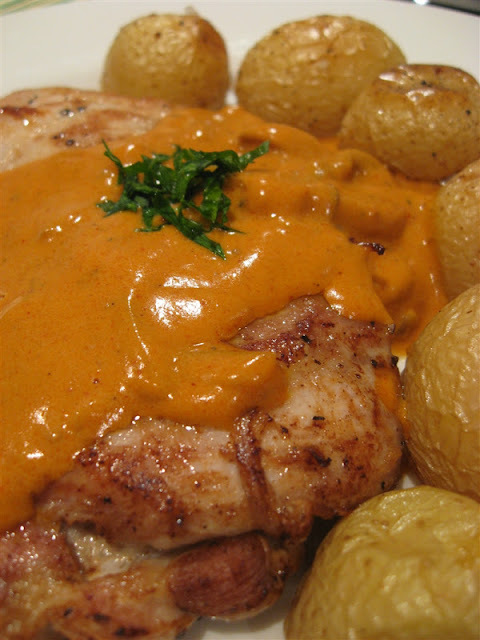 I like a combination of sweet and smoky to give the sauce a little depth. Különleges (Special Quality): The mildest and brightest red of all Hungarian paprikas, with excellent aroma. Édes csemege (Delicate): Ranging from light to dark red, a mild paprika with a rich flavour. Csemegepaprika (Exquisite Delicate): Similar to Delicate, but more pungent. Csípős Csemege, Pikáns (Pungent Exquisite Delicate): An even more pungent Delicate. 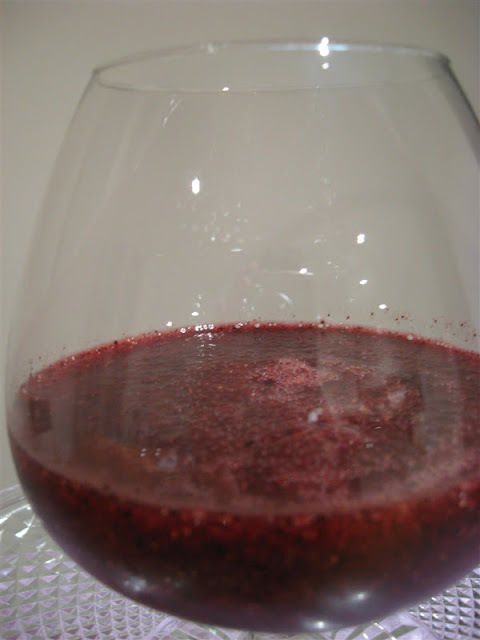 Rózsa (Rose): Pale Red in colour with strong aroma and mild pungency. Édesnemes (Noble Sweet): The most commonly exported paprika; bright red and slightly pungent. Félédes (Half-Sweet): A blend of mild and pungent paprikas; medium pungency. Erős (Hot): Light brown in colour, this is the hottest of all the paprikas. Red paprika originated in the Americas and was brought to Europe via Turkey and into the Balkans. 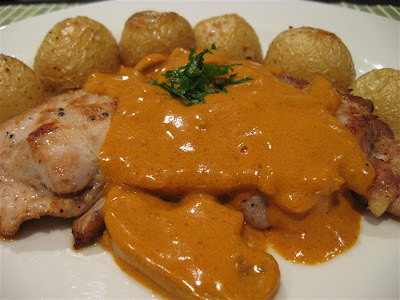 The first record of paprika in Hungary comes from 1748. The word paprika is the Hungarian word for "pepper" from the Serbian/Croatian word paprena for “the hot pepper”, which in turn came from the Latin piper for “hot pepper”. 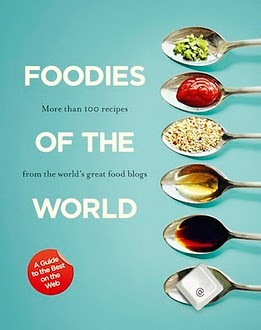 Anna’s adaptation of various internet recipes. Serves 2. 1. In a large frying pan, heat cooking lard/butter/oil and brown the chicken. Set aside on a plate to rest. 2. Fry onion and garlic until translucent. 3. Add paprika and bay leaf then fry until fragrant (30 seconds). 4. Add chicken stock, seasoning, chicken thighs and any juices from sitting. 5. Simmer for 10-20 minutes, or until chicken is cooked, then remove bay leaf and chicken. 6. Increase the heat and boil the liquid until reduced by half. 7. 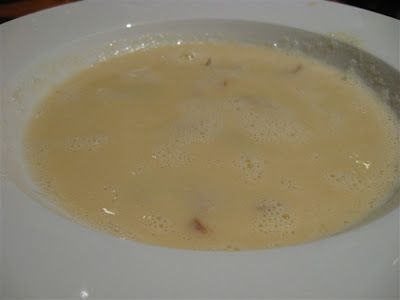 Remove from heat and stir through crème fraîche. 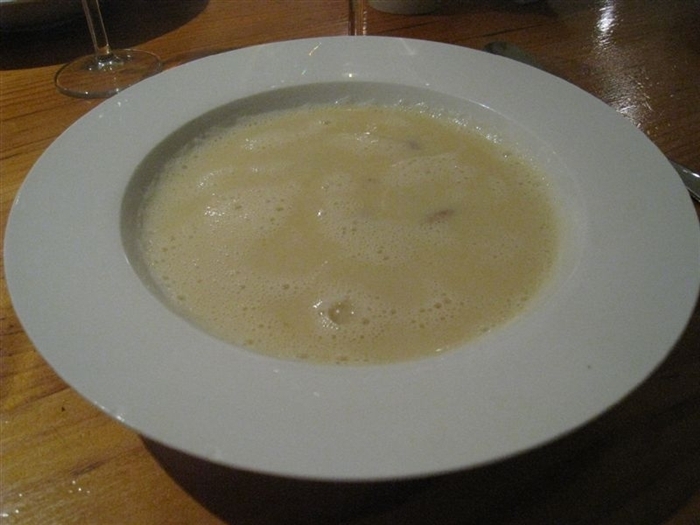 If the sauce is not thick enough, remove ¼ cup from heat and stir through a little cornflour. Return to pan and stir until thickened. 8. Return chicken to pan on heat on low until the chicken and sauce is hot enough for serving. 9. Serve hot over potatoes or noodles. This is my entry to Nutriferia’s event, Hungry for Chicken? Check out the round-up on 20 July. This is my third time participating in the vegetarian food bloggers event AWED, also known as A Worldly Epicurean’s Delight, which has a regional focus every month. 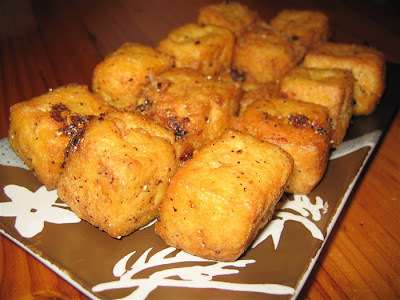 This month it’s China so I decided to share Jonas’ recipe for salt & pepper tofu, a tasty, spicy snack that can be had any time of the day or eaten as part of a banquet. Most people would use firm tofu for this recipe, with a dusting of cornflour to make a crisy exterior, but I just love to use bean curd puffs (taufu bok) because they’re light and fluffy and the crispy outside is almost there before you even begin cooking. Call me lazy, but I know what I like. 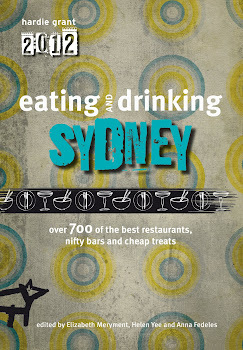 Visit the Culinary Bazaar for the AWED round-up. Recipe by Jonas. Serves 4 as starter in banquet. 1. With a mortar and pestle, grind peppers, chilli flakes, salt and garlic powder into a fine powder. 2. Heat oil in a frying pan or wok. 3. Brush tofu puffs with a little oil then dust each in pepper powder. 4. Fry puffs until hot and crispy. 5. Combine scallions, ginger and soy sauce to form a dipping sauce. Serve with hot tofu puffs. First of all I want to say that these aren’t the best photos and they don’t do justice to this delicious Greek soup made exclusively of chicken stock, whisked egg and lemon juice. The most important aspect of making avgolemono is to use excellent quality chicken stock since this is the main flavour of the soup. It is crucial! Imperative! Dire! Are you starting to sense how important it is? Most recipes for avgolemono start with a whole chicken and train you to make your own stock from scratch. If Jonas wasn’t a vegetarian then I would certainly go to the trouble, but I have to admit I am too lazy to spend all that time lovingly making chicken stock for a soup that only I will eat. I’m going to provide you with a cheater’s version to avgolemono. Using this quick recipe you can whip up a delicious dinner in next to no time. I buy my stock from health stores or gourmet butchers because they tend to sell quality stocks. You don’t want it too salty or tasting of cardboard/cans. My recipe uses the soup as an entrée (starter) but if you would like a light main course instead, use one chicken thigh fillet per person and separately cook a half/quarter cup of risoni, stelline or other tiny pasta shapes per person to stir through at the end. This is such an easy soup to master and it yields a delicious meal. Once it's in your repertoire you’ll use it regularly! Based on recipe from Falling Cloudberries by Tessa Kiros. Serves 6 as starter. 1. Bring the broth to a gentle simmer. Remove from heat. 2. Whisk the eggs until they are very fluffy. 3. Add lemon juice and whisk again. 4. Add a ladle of hot broth to the egg, whisking to prevent cooking. 5. Whisk in another ladle of broth to bring the egg to the correct temperature. 6. Pour the egg mixture into the broth and whisk quickly to combine and prevent scrambling. 7. 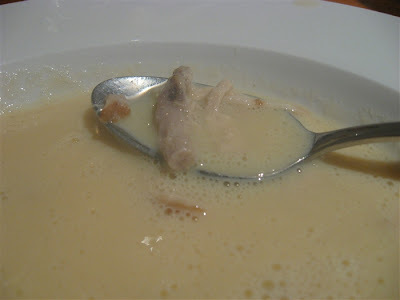 Add chicken meat and return broth to a low heat and cook very gently, stirring, until the egg is warmed through and turns the soup a pale yellow colour. 8. Season to taste and serve immediately. This avgolemono is my contribution to Kate from A Merrier World's chicken-related event "Let Them Eat Chicken!" The event drew my attention because it discusses how international demands for cheap chicken meat has created cruel farming tactics which leads, down the line, to poor quality meat. Since Jonas is a vegetarian I don’t often buy meat, so when I do it’s a treat and I splurge on aged beef and organic lamb. I buy chicken even less because, until recently, I really didn’t like it. I thought it was a boring meat and wondered why so many little chickens had to die for us to eat such a mundane meal. Then I realised that it was the chicken breast I disliked, those chunky, dry slabs of meat that do nothing for the palate, but that cheap chicken thighs, containing small amounts of fat, were full of flavour having lived so close to the chicken’s bone. I have just started eating chicken and so Kate’s event drew my curiosity and has made me ponder what cuts of meat and which places I will buy my chicken from in future. I have decided to buy organic chicken. If I don’t eat it that often I can afford to buy the good stuff. For the avgolemono, apart from the bought stock, the chicken thigh fillet I used in this dish was very flavoursome and beats a hunk of breast any day! 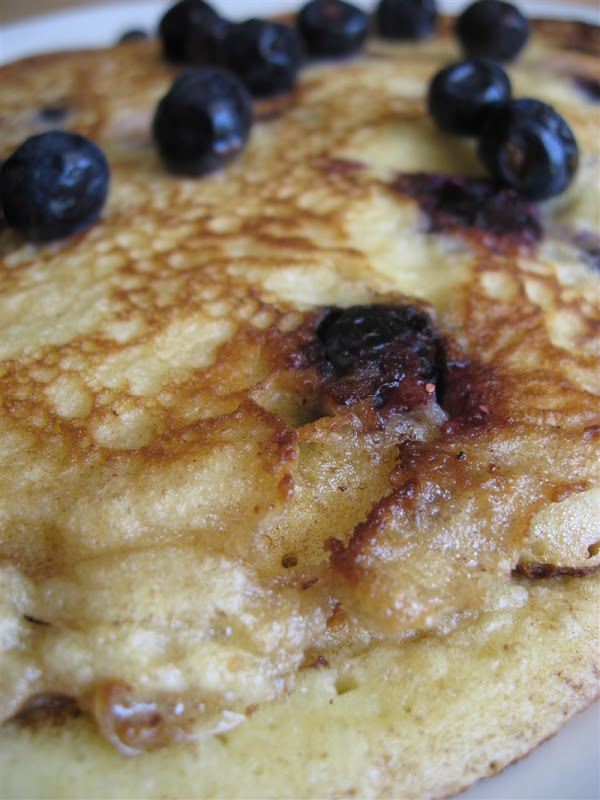 And with this seventh blueberry recipe, my Blueberry Week ends. I’ve managed to pull off seven blueberry recipes in seven days without having a mental breakdown and I hope everyone has enjoyed them. This recipe was superb. I cajoled Jonas into making it for me (he is gifted when it comes to bread making) and it turned out wonderfully. I’m not a big fan of bread but this focaccia was so soft on the inside and had a slightly crunchy surface due to the sugary crust, I was hooked. When it came out of the oven, we sat down with some butter and devoured the whole slab in about 10 minutes. Whoosh! One minute it was there, the next minute it was in our bellies. The only evidence that it ever existed was some small blueberry stains on the cutting board. Jonas is keen to try the recipe again with some rosemary and salt and I’d like to throw in some finely sliced potato pieces too. Or this that just too much carb on carb? Anyway, it’s a very good recipe and makes a perfect brunch. It takes a bit of time, since there are a few waiting periods while the dough rises, but the recipe is very easy and straightforward. I think next week I better post some savoury food to counteract all these recent desserts! Recipe from Taste.com.au Serves 4-6. 1. Combine warm water, yeast, salt, and 1 teaspoon of sugar in a jug. Mix well. Cover with plastic wrap and leave in a warm place for 5 minutes until bubbles form on the surface. 3. Add yeast mixture, 2 tablespoons sugar and 2 tablespoons oil. Mix to a soft dough. 4. Turn onto a lightly floured surface and knead for 8 minutes or until smooth. 5. Place into a lightly greased bowl, cover with plastic wrap and leave in a warm place for 1 hour or until doubled in size. 6. Preheat oven to 220°C. Combine remaining sugar and cinnamon. 7. Punch dough down. Knead on a floured surface. Roll out to form a 32cm x 18cm rectangle and place onto a greased baking tray. 8. Cover with plastic wrap and leave in a warm place for 30 minutes. 9. 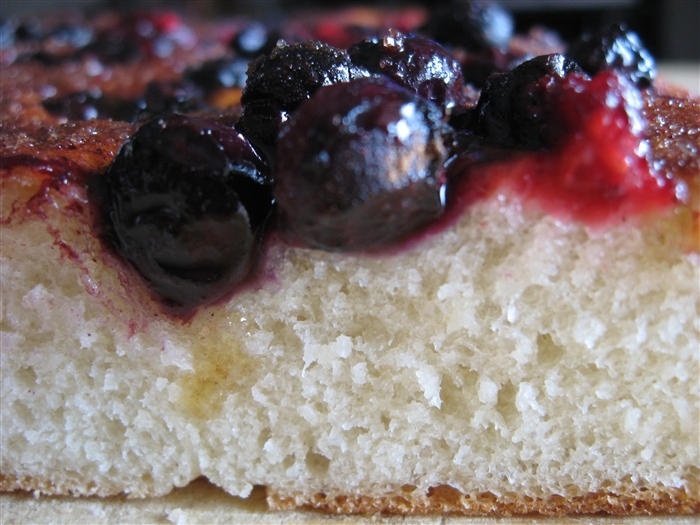 Dimple surface, then blueberries evenly over the surface. Sprinkle the sugar all over the focaccia. 10. Bake 15 - 20 minutes or until cooked. 11. To serve, brush with remaining oil and sprinkle with cinnamon sugar. Note: we used a few raspberries here as well, but they do bleed a lot so if you want a "cleaner" look stick with blueberries. After making so many sweet dishes for Blueberry Week, I thought it would be nice to make something savoury. I stumbled across this great venison dish on Jamie Oliver’s website. 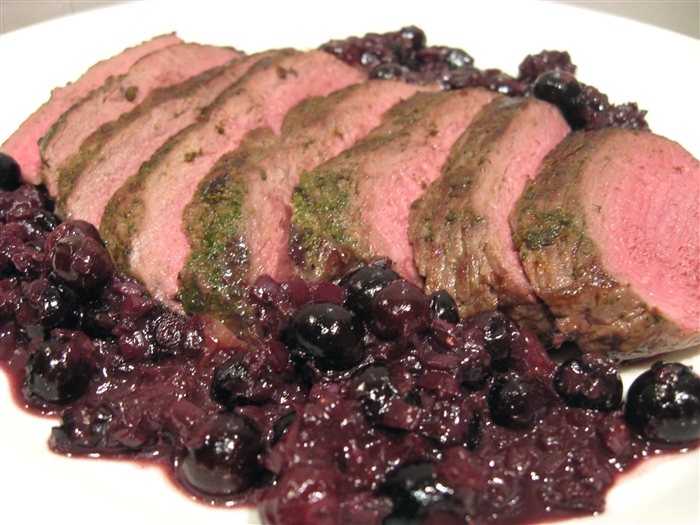 Jamie brilliantly pairs hearty game meat with juniper and thyme and blueberries. 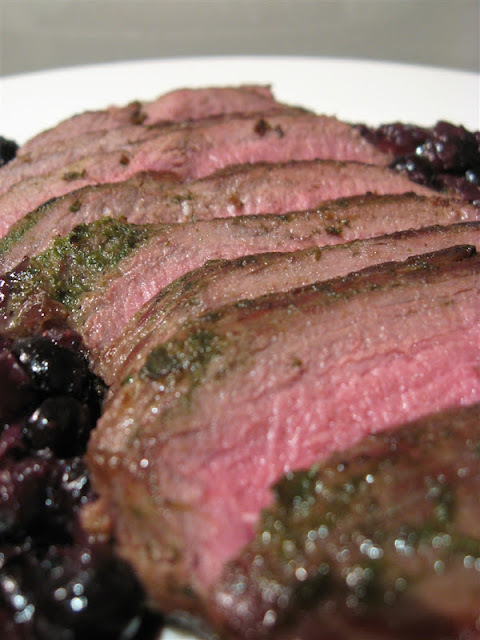 It’s a great match with the sweetness of the blueberries cancelling out the slight bitterness of the juniper and both cutting through the iron richness of the venison. 1. Bash up the thyme and juniper berries in a pestle and mortar with a really good pinch of salt and pepper. Loosen with 2 good lugs of olive oil. 2. Pat the venison dry with some kitchen paper and rub the thyme mixture all over it. 3. Sear the meat in a hot pan on all sides (roughly 6 minutes for medium rare, 7-8 minutes for medium: don’t cook it anymore than that and use your instincts not your clock!). 4. Remove it from the pan when it’s cooked to your liking and allow it to rest on a plate for 4 minutes, covered with tinfoil. 5. Reduce the heat under the pan and add a good lug of oil. 6. Add the shallots and the garlic and fry gently for around 3 minutes until translucent and tender. 7. Turn up the heat again, add the wine, and let it reduce by half. 8. Add the blueberries and simmer slowly for 4 minutes, then remove the pan from the heat. 9. Add the butter and jiggle and shake the pan around so the sauce goes slightly opaque and shiny. Season to taste. 10. Slice the venison into 2cm slices. Add the meat’s resting juices to the sauce and spoon over the venison. Serve with vegetables or salad passed separately. Note: If you haven’t got a pestle and mortar, use the end of a rolling pin and a metal bowl. I've already dealt with thyme, and surely no one wants me to talk about blueberries anymore, so let's focus on juniper berries. Well they aren't real berries at all, but the female seed cone of various juniper trees, such as the Juniperus communis, which is the one most commonly used in cooking. In fact juniper berries are the only spice that come from conifers. The mature, dark berries are used both fresh and dried in cooking, whereas immature green berries are what imparts the crucial flavours in gin. In fact the English word “gin” is a direct derivation from the French genièvre and the Dutch jenever which described the juniper branches and berries used to flavour the spirit. The outer part of berry is pretty flavourless so most recipes call for juniper berries to be crushed in order to bring out the essential oils. Apparently fresh mature berries are the strongest in flavour and lose their intensity during drying and storage. Juniper has been used as far back as ancient Egypt, where berries have been found in tombs; Greece, where athletes believe juniper to increase their stamina for the ancient Olympic competitions; and Romans used juniper berries as a substitute for black pepper because it was too expensive. Today the berries are used extensively in Scandinavian and other Northern European cuisines such as German, Austrian, Czech and Hungarian. 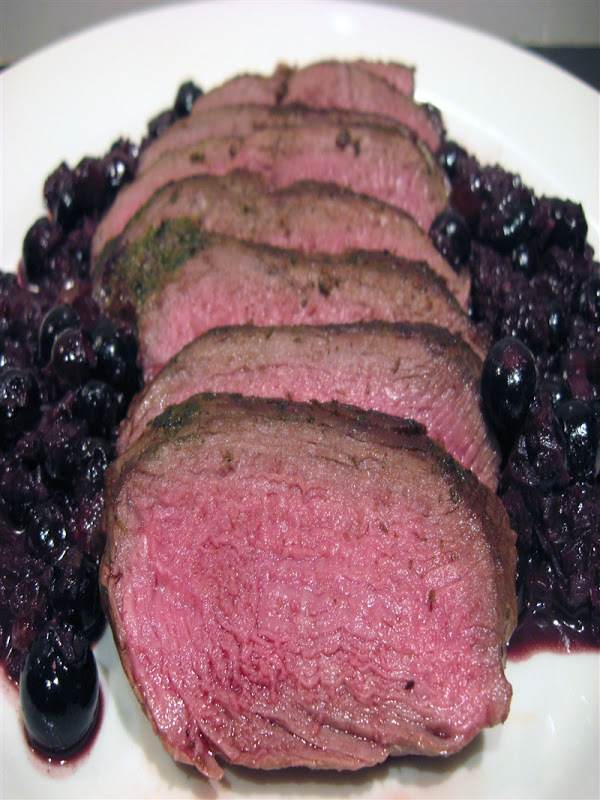 Juniper pairs especially well with strong game meats, wild birds, pork and cabbage/sauerkraut. This is my contribution to Weekend Herb Blogging, hosted this week by Pam from Sidewalk Shoes. 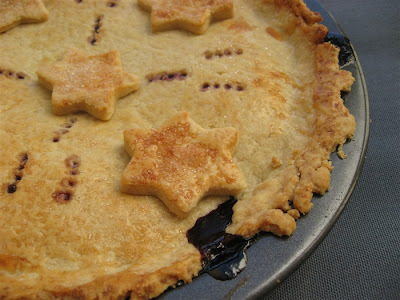 And how better to mark the occassion than with a blueberry pie for Blueberry Week. Pies make me think of the US and my paternal grandmother. She was a talented pie maker and I don’t think I ever eat a pie without thinking of her. Born in Pennsylvania in 1922, Grandma seemed to be a typical American woman from her generation. During WWII she served in the Airforce until she married my grandfather, she sewed all her own clothes, decorated cakes professionally and was an observing Baptist. She was a wonderful cook and was especially good at cakes and pies and desserts. She was happy and round and warm. 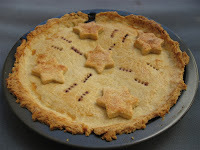 The first time I ever made a pie I stumbled across a wonderful shortcrust pastry which I now use every time. Apricot and peach pies are my favourite kinds to make, but I always dreamed about having enough berries to make a blueberry pie. With the massive blueberry batch from Shamu, I was able to make my dream come true and created this wonderful blueberry pie. I baked it for a harbour side picnic way back in April to farewell our little sister, Stinky, before she moved to Amsterdam. Unfortunately the photos of the filling aren’t that good because they were taken on the picnic rug, but you get the idea. 1. Preheat oven to 180°C. Grease and line pie dish. 2. Sift flour and pinch of salt. Rub in butter until crumbly. Add sugar. Add 2-4 tablespoons of water. Mix. 3. Gather dough. Divide into two balls. Flatten balls and roll into circles large enough to line pie dish. Put one circle in base of pie dish. Wrap and chill remaining circle. 4. 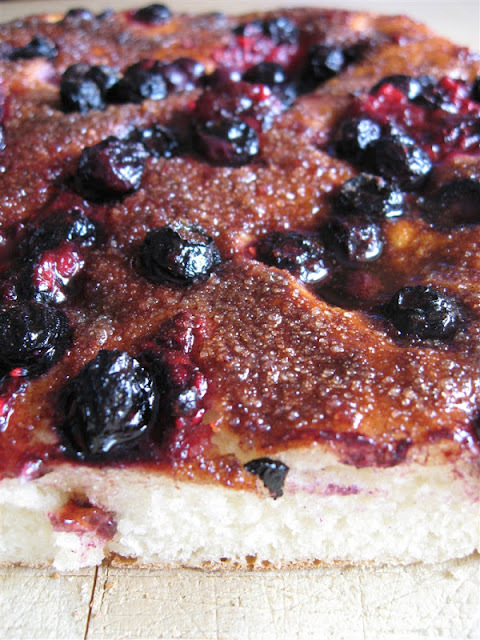 In a pan combine the blueberries, sugar, orange rind and half the orange juice, and heat over a gentle flame. Check for sweetness and add more sugar if needed. 5. Mix the cornflour with the remaining orange juice until dissolved. 6. Add to blueberries and stir over low heat for 5 minutes or until the mixture boils and thickens. Remove from heat and set aside to cool. 7. 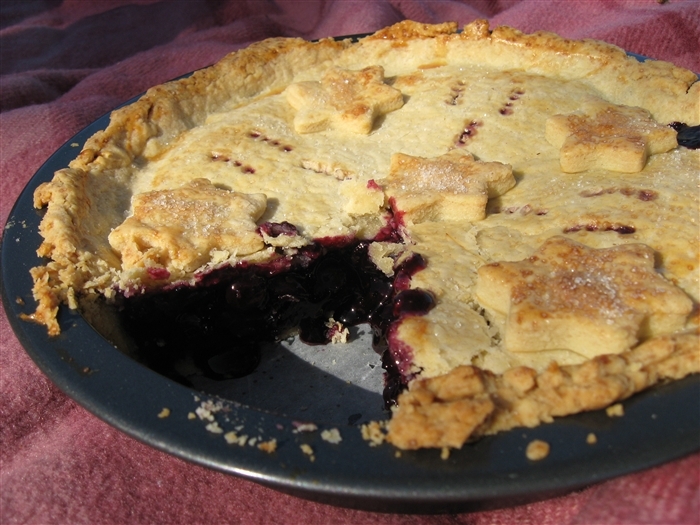 Pour filling into pie dish, cover with remaining dough and cut edges with a knife to remove excess pastry from sides. 8. Roll out excess pastry and use cookie cutters to shape. Place on pastry lid as decoration, using the beaten egg as glue. 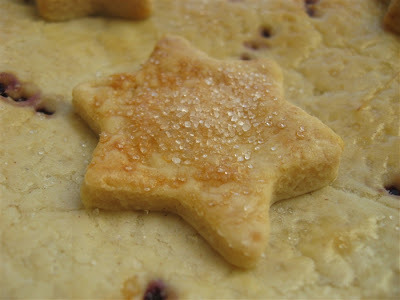 Glaze pastry with egg and sprinkle with sugar. 9. Prick pastry to allow steam to escape during cooking. Bake for 50 minutes or until pastry is golden brown and crunchy. Note: my original recipe used only half the pastry ingredients but upon making this again (August 2010) I didn't have near to enough pastry. The measurements you see above are the doubled version which I think will be much better and allow excess for decoration. 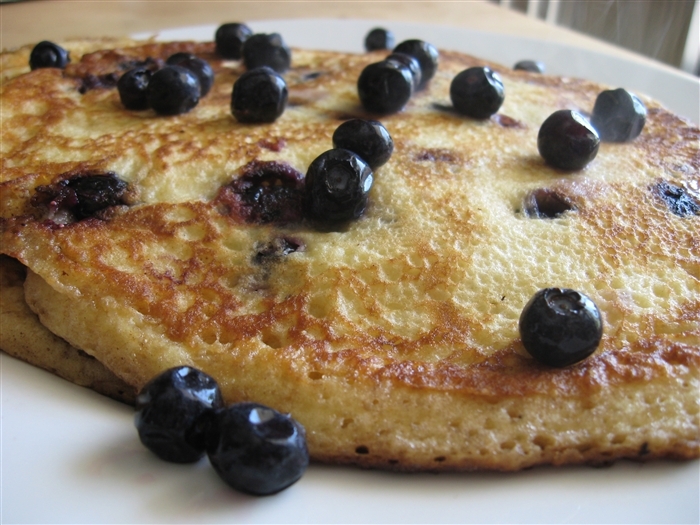 These pancakes, part of my Blueberry Week, are a perfect start to the day. Warm, sweet, fruity. 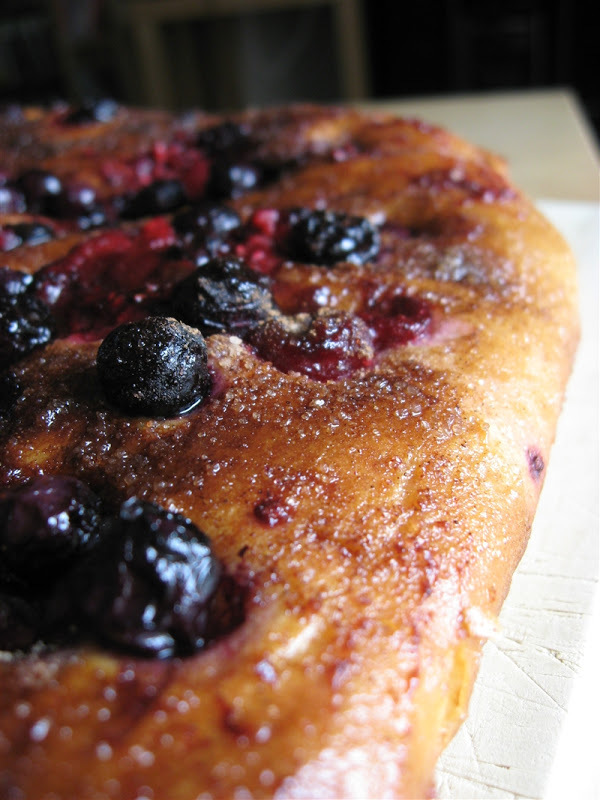 The use of wholemeal flour gives a slight earthy flavour to contrast with the sweetness of the berries. Not to mention the litres of maple syrup topping lathered upon them before eating. Oh, so maybe that’s just me. Pancakes are strongly associated with the men of my life. As a child, my American father would randomly make them for weekend breakfasts and my brothers, father and I would have competitions to see who could eat the most. When my parents divorced my mother was bitterly jealous that I rated my father’s pancakes higher than her’s. She would offer to make them for me, but I’d say something insensitive like “Oh no, don’t worry. I’m going to Dad’s house next weekend and I’ll have them there. His are much better.” Mum couldn’t figure out why Dad’s were so much better and she’d drill me for information on the texture, the ingredients and how he cooked them. 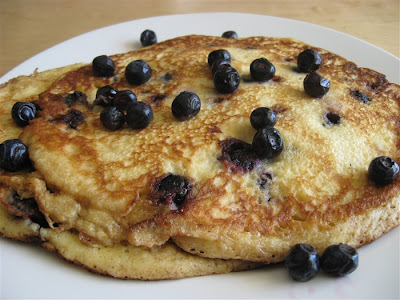 Perhaps I was being obstinate, but I refused to betray my father’s pancake recipe and even though, somehow, Mum eventually mastered the humble pancake to make them on par with Dad, I never told her so. Christmas 2003, my grandparents, cousin and aunt visited from the US and my two older brothers had brought their families from interstate. We gathered at my father’s house and suddenly the smell of pancakes wafted out of the kitchen. It was just as I remembered. Visiting my brother in Queensland, I have also seen him making pancakes for his kids on the weekend, passing on the tradition. And then there is Jonas. He is a breakfast fiend, or perhaps I should say “breakfast nazi” since he will only eat traditional Western breakfast foods in the morning. I could devour a bowl of spaghetti bolognese or chile con carne, but Jonas will opt for baked beans or cereal. This strict breakfast regime has its benefits, since Jonas is often happy to whip up some French toast, BLTs or even some delicious pancakes. So now that I’m all grown up, my husband makes me pancakes and, without even knowing it, continued the male pancake tradition in my family. Based on a recipe from Burke’s Backyard. Makes 8-10 pancakes. 1. 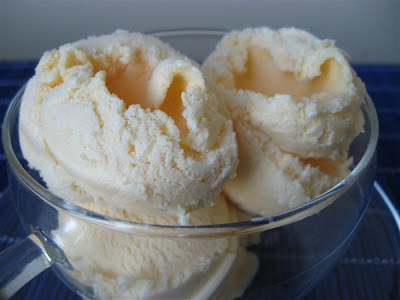 Tip the sour cream into a large bowl and add 3 egg yolks and a little of the milk. Mix ingredients together then add the rest of the milk and stir it through. 2. Add the dry ingredients and blueberries, folding them through the mixture so that the moisture is absorbed into the flour. 4. In a separate bowl beat 3 egg whites until they form soft peaks. 5. Add a little of the beaten egg white to begin with and mix it in briskly, then add the rest of the egg white folding carefully so as not to burst the air bubbles. 6. To cook, turn the heat on high under a non-stick frying pan. When the pan is heated turn it to a medium heat. Use some kitchen paper to smear a small amount (about a teaspoon) of butter around the warmed pan. 7. Add the pancake mix to the pan to the size required. They take about a minute to a minute and a half on each side, depending on the size of the pancake. 8. 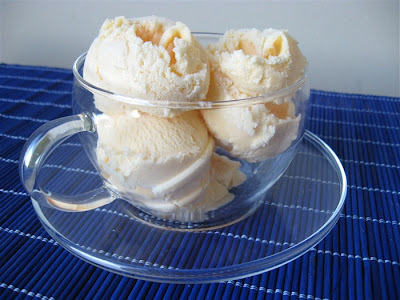 Serve on a plate with maple syrup and a dollop of cream. This pancake recipe is my contribution to Susan's Pancakes on Parade, a foodie event focusing on sweet and savoury pancakes. 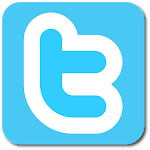 Check out the round-up once it's posted on the Well Seasoned Cook. This Blueberry Week cocktail is sweet, simple and truly delicious. 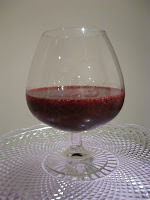 How can you go wrong with berry flavour spirits and liqueurs, a slight touch of hazelnut and fresh blueberries? 1. 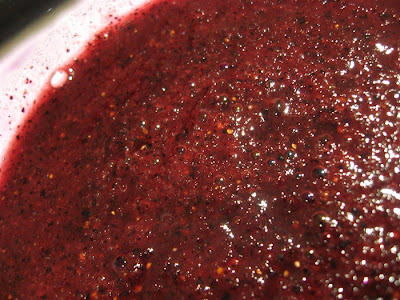 Combine in a blender and puree until frothy. 2. Serve in a large glass. These kinds of steamed puddings seem quintessentially British to me. 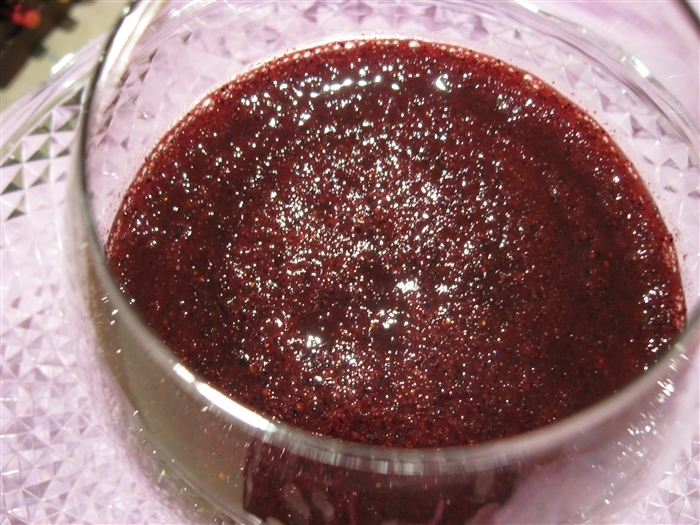 I think of Victorian families huddled around their dinner table, turning out their puddings and watching the berries and juices dribble down the sides. OK, so that’s probably more romantic than the dank, stuffy reality of Victorian England, but let me dream. 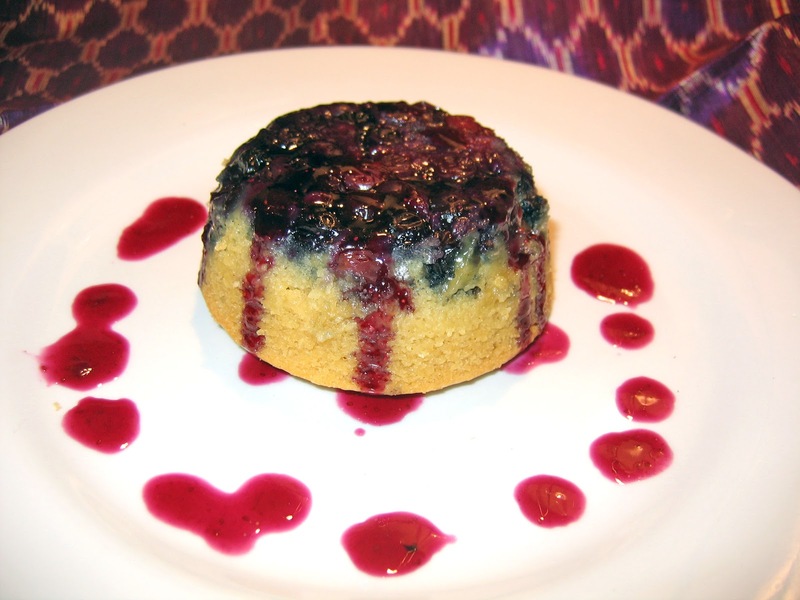 Steamed puddings are wonderful winter desserts, and since I started my blueberry week yesterday with a chilled summer soup for my Northern Hemisphere friends, today I had to resort to wintery comfort food for my own selfish sake. You see I am reading Northern Lights (aka the Golden Compass) and since most of it takes place in the Artic, all I want to do is curl up in a ball under a heavy blanket and eat warm cakes. 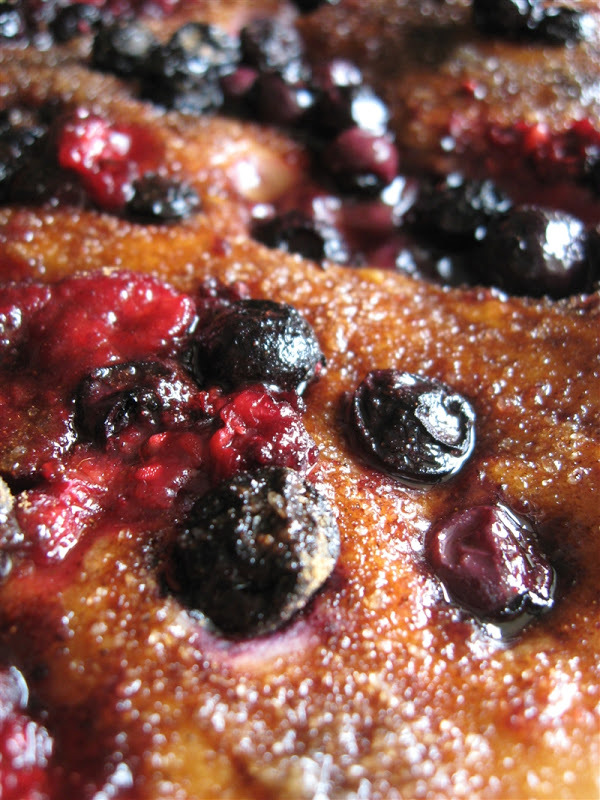 I was so proud of this pudding because I devised the recipe measurements all by myself and delivered a perfectly textured, dense yet fluffy, cake with a slight almond hint and delicious intense blueberry flavours. Anna’s very own recipe. Makes 4. 1. Preheat oven to 180’C. Grease 4 baking moulds with butter. 2. 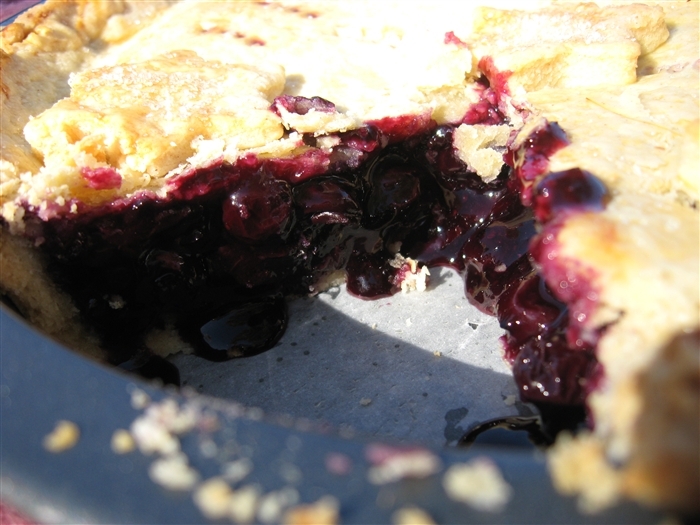 With the extra tablespoon sugar and lemon juice, heat blueberries for about 5 minutes until they soften a little. 3. Using electric beaters, beat golden syrup, vanilla beans, sugar and butter for 2 minutes until light and fluffy. 4. Add eggs one at a time and beat until combined. 5. Sift in almond meal and flour then fold into butter mixture. If mixture is too dry, add a little milk. 6. In the base of each mould spoon in two tablespoons of the blueberries. Top with cake batter. 7. Cover each mould with foil then place in a large baking tray. Pour boiling water halfway up the sides of the moulds. 8. Bake in oven between 40-60 minutes or until puddings have set and a skewer inserted into the centre comes out clean. 9. Run a knife around the edges of the moulds and invert onto a serving dish. 10. 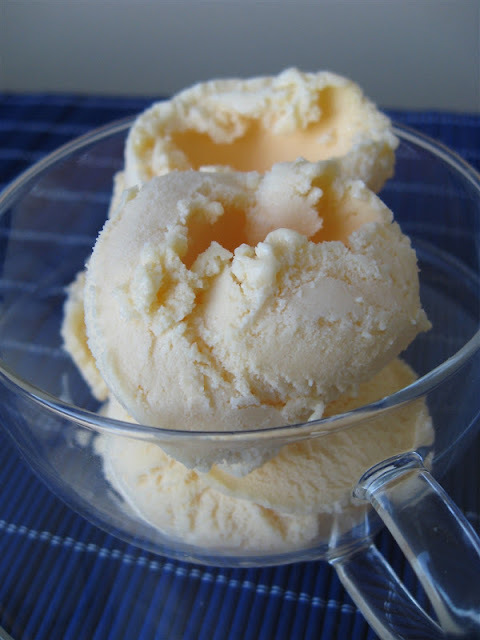 Spoon some more blueberries around the edges and serve with custard, cream or ice cream. I want to enter this recipe into Waiter, There's Something in My . . . hosted by Cook Sister with the theme of berries, something that seems to be a very choice ingredient for blogging events hailing from the Northern Hemisphere at present. They must be having a berry nice summer up there. OK, that's it. No more bad punnets from me.